Happy Belated 8-Track Day (April 11th)! I couldn't remember when this beloved holiday began so I started doing a search on the internet. It seemed like no one could really put an actual date to it. I think my Dan came up with National Open A Sealed 8-Track Day back in . Whatever it's original origins, it's a fun little holiday. I saw a post recently for another online 8-track store (they sell LP's, CD's, etc. too) that talked about being the largest independent online seller of 8-track tapes. And a present they might have a larger collection than we do, but we've been doing this for a whole lot longer and probably have had as many tapes as they claim to have throughout the years. 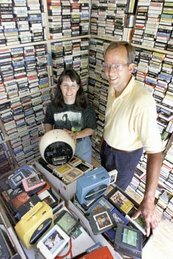 Our first large purchase of tapes was 5,000 + players and related 8-track items. Our next was 10,000 tapes. We sell large quantities for projects all over the world. Many of these tapes have been used in cool art projects. One of our local Red Robin restaurants has a large wall art of 8-tracks that were purchased from us from a company out of Canada who uses the tapes in various art related ventures. Our goal when we started our business back in 1998 was to bring the prices for common 8-tracks back down to reasonable prices. That's not to say that there aren't some 8-tracks out there that aren't worth a little more. There are some really rare or unusual carts out there that can & do command a higher price. The key thing to remember about those tapes (and sometimes even the common tape) is that the tape is worth what someone is will to pay. Our goal is still to keep the costs of 8-tracks down. We try to keep it fairly simple. We don't have a shopping cart right now or pictures of every tape we own. We do try to give fairly accurate descriptions of the tapes we put up for sale. We also try to provide the full 8-track experience by selling a wide range of 8-track supplies and accessories. We offer a repair service, but we also sell repair supplies for those who like to do their own repairs. If there's something you're looking for and we don't have it, we'll try to get it for you or tell you where you can find. I know we don't presently have 90-100,000 tapes in inventory, but we could if we wanted too; we know where to find them. I like to think that it's our reasonable prices and good service that keep our customers coming back. We have fun with this business! When the day comes that we don't, then it's time to sell to our competitors! ;) I guess it's time to get off of my 8-track box and take a deep breath! Hope everyone had a great 8-Track Day and a good Easter!!! Have to go and find some cool decorations to throw our oldest daughter a party next weekend. She will be graduating college and heading off for a fun trip. Man, I wish I were going, but she said she'd take me next time! ;) We also put up a new list last week, so check it out if you haven't had a chance to.